← TURN DETROIT’S LIGHTS ON! Heroic Detroit Wastewater Treatment Plant workers wildat strike Sept. 30, 2012: THE BATTLE FOR DETROIT BEGINS NOW! John Riehl and Local 207 leaders had built for this strike for months, foreseeing what was to come if the people did not rise up in a general strike. Now, under the dictatorial emergency manager and illegal bankruptcy, Detroiters have lost their city, at least for now, including its most valuable asset, the Detroit Water & Sewerage Department. DWSD was the third largest municipal water and sewerage facility in the country, covering six counties and 137 communities. Local 207 was its largest local union. John Riehl, Local 207 President, at funeral for another militant union leader, Leamon Wilson, Pres. of AFSCME Local 312, D-DOT Mechanics, on April 15, 2015. Leamon was only 55. John also lost his life too early, fighting for the people. John Riehl, president of AFSCME Local 207 from 2000-2012 has died. Detroit and the labor movement has lost a great and uncommon leader. John worked at the Detroit Wastewater Treatment Plant for 34 years under difficult and dangerous conditions. During most of that time he served as an elected union steward for AFSCME Local 207 which represented Detroit Water& Sewerage Department workers. He headed the rank & file militant caucus City Workers for Justice (CWJ). He helped lead countless fights both inside and outside the union for the rights of workers, Detroiters and the oppressed in our society. He helped make Local 207 a symbol of labor’s fight for civil rights. 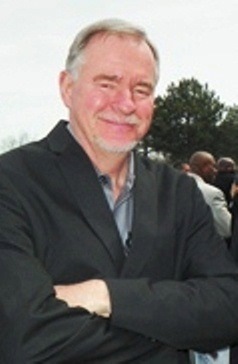 He served as the elected President of AFSCME Local 207 from 2001 through 2012. During that time John steadfastly stood against the tide of concessions being demanded of Detroit’s public workers, even if it meant being the only union president to do so. City workers always knew that John could be trusted to defend them when no one else would. John laughed when the press sometimes referred to him as a “union boss.” His members knew him as their elected and accountable leader who administered their union democratically and with integrity. Based on this reputation he was later elected to represent all city employees on the Detroit General Pension Board. WWTP workers guard back of plant during strike. 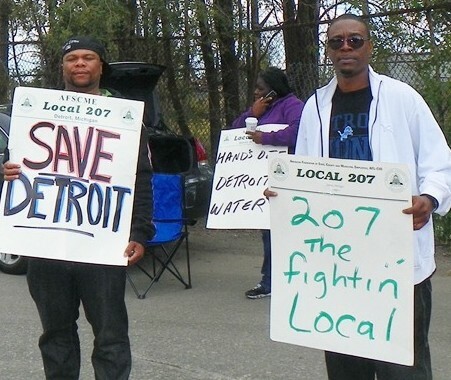 Facing an imminent takeover of Detroit by the Emergency Manager, John led a strike of Local 207 in the fall of 2012, openly defying a federal court order and threats of arrest. When no one else would fight, John would. John was a supporter of the civil rights organization Coalition to Defend Affirmative Action, Immigrant Rights and Fight for Equality By Any Means Necessary (BAMN). Below is a Face Book posting by a leader of BAMN. 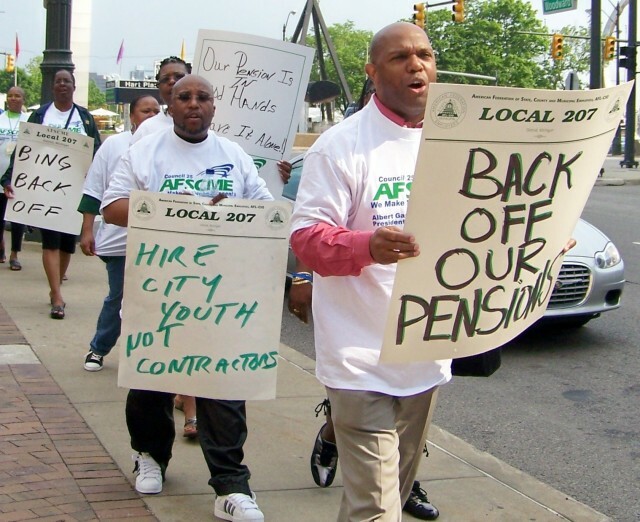 Local 207’s signs were prominent at every city union action. 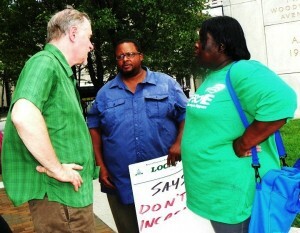 Riehl consults with local union members including Local 207 VP Lakita Thomas during protest Aug. 2, 2012. When John spoke at City Council meetings and rallies, he never gave long rhetorical speeches. He spoke like a worker, in short militant sentences. It was obvious that his experience representing individual workers over the years had given him a deep understanding of their concerns. C/O Mrs. Pattie Riehl @ above funeral home address. Please keep the Riehl family in your prayers. My name is Jeremy Wilson. I was born February 9th, 1974. I was told, by my mother born Cheryl Loise Ray, then Cheryl Ray Wilson, that John Reihl was my biological father. I met with him once in 2006. He wasn’t sure if I was his son or not. He offered me a job. I moved back to Texas before I could accept his offer. I would love to have know him better. I will greatly accept him and his family as well. I live in Houston, Texas. I am saddened to hear of his passing. I understand that he was a beloved man. I can be reached by family at 712 Pinemont Dr. Apt. 22 Houston, TX 77018. I mourn for you all. God bless you. Godspead John. You look like me. You justly worked more than me and have more loved ones than I. You deserve it. You earned it. Peace to everyone you left behind. I ended up getting an Honorable Discharge from the USMC after I served in 1996 and 1997. I heard that I have a grandmother from Germany that is still alive. I hope she wants to be reach me by mail. I don’t expect anything in the way of money or property. I only want peace for all of you and myself and closure. I have many questions, though I am to shy to ask them in person. I am the lucky girl who got to have John for a big brother. He taught me so much. We were very close. We always stood together. I am so proud of him! I am the lucky gal who got to have John as her big brother. We were very close. He taught me so much. We always stood together. I am so proud of him! I’m deeply sadden I’ve lost the Greatest Union President and best friend Afscme will ever havehe never back down even when other union leaders didn’t agree with him,didn’t sell his member’s out he stood toe to toe with them on issuel . ” now it’s 2015 looks where we are at,look at the city and most importantly look at the the Detroit Water & Sewerage Department employees are loosing their jobs at a rapid pace who cares ? The mayor,City Council as to what’s going on to Dwsd employee who’s going to fight for them now Rip John Riehl. My sister has lost a loving husband. I have lost a GREAT brother in law. My young sons had the HONOUR to have known uncle John. I however wished that they had the opportunity to learn some of life lessons from uncle John. All parents wish their kids would follow in the footsteps of Doctors, Lawyers etc. I would have been proud if at least one of my sons followed in uncle John footsteps. We love you uncle John and may you wherever you are, rest in peace. To my loving and dear sister Patty, nothing ever could replace the man you have lost, may you find comfort knowing that we are all here for you. RIP, Brother Riehl. You did indeed fight the good fight. You took management to the wall many a day, championing the rights of AFSCME 207 members, as a steward and as President. You stood tall when others folded like cheap suits, often standing alone to support those issues that weren’t always popular with the so-called mainstream. Thank you for your leadership, your perseverance and steadfastness. John Riehl was an inspiration to all of us in his quest for well being of workers. I worked with him in stopping Minergy from robbing workers and ratepayers. Minergy sold its claims to Synagro, which collapsed in federal proceedings. Now NEFCO is stepping to the plate, but it will collapse by using unworkable technology. Riehl showed to us that persistence pays off. Rest, dear warrior of justice. Your fight is over now. strike the Jordan of oppression and tyranny. Where true social justice will reign.